Hi everyone. 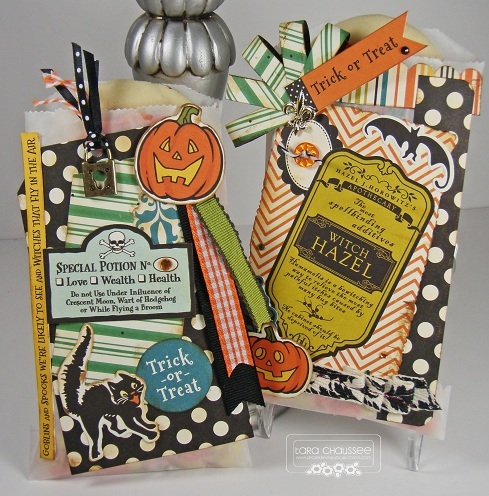 Halloween is all about the treats of course and today I have some very charming treat holders to share with you! 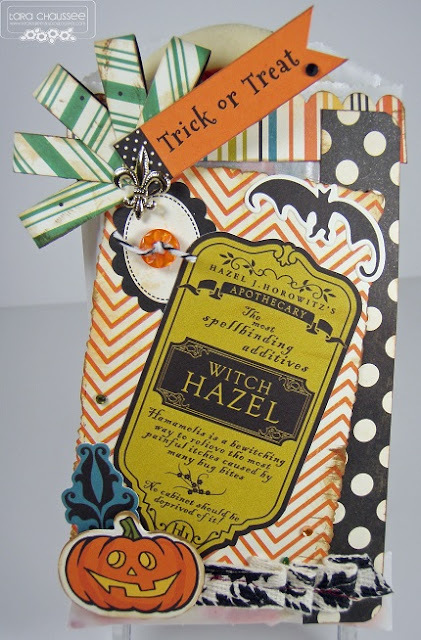 I have professed my love for the October Afternoon 'Witches Hazel' paper pack and, as promised, here are the rest of the items I created with it. 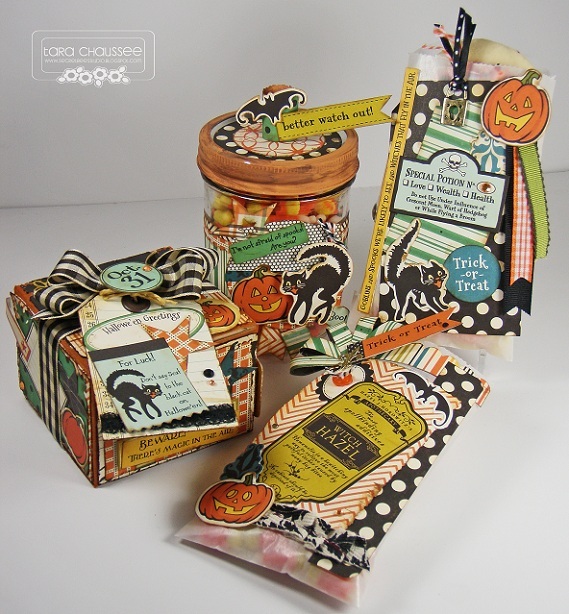 The first treat holder is a delightful little box that is stuffed full of Halloween cookies. 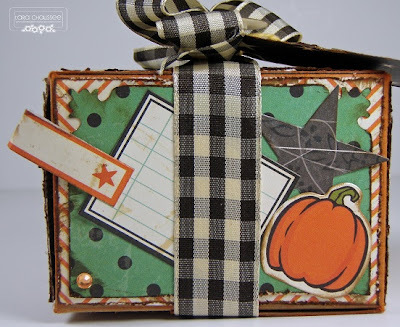 The box is from Stampin' Up and I first inked the edges with 'Tangerine' Memento ink. Then on to the fun and exciting part of choosing the papers, stickers and embellishments to use! I cut stars with my MFT Die-namics Star Stax and put one on each side of the box , including the adorable tag on the top. Pictures of the other two sides of the box. All are so cute! 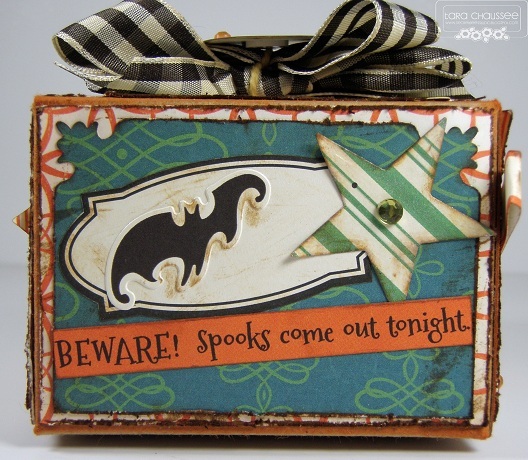 The checkered ribbon came from a package of Verve stamps I had previously ordered. Love to re-use! I also covered some glassine bags with more of this darling paper set and layered them with lots of the stickers and labels. The first treat bag features half of a Papertrey Ink Loopsy Daisy die, some Foo-Fa-La ribbon and a Fleur-de-lis. The second bag shows the scary cat and a sweet sentiment. 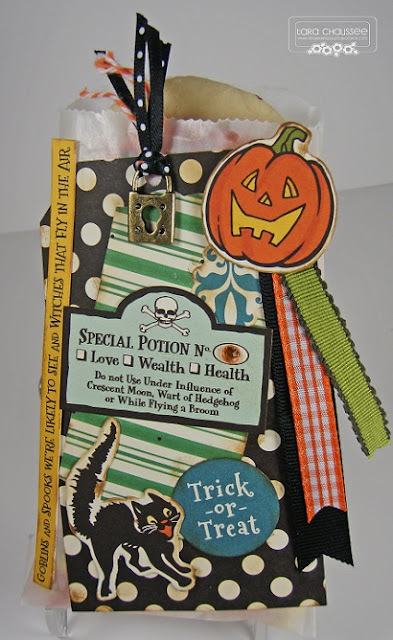 I also added some ribbon and twine and a Prima padlock for safekeeping those treats! 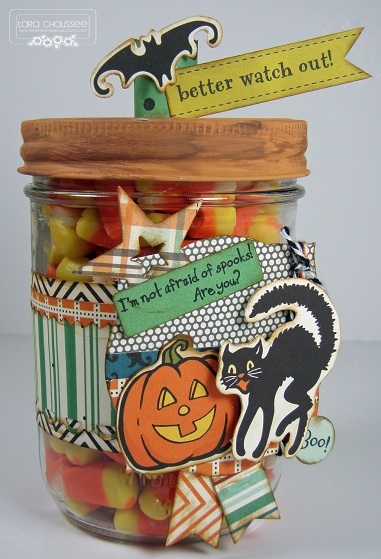 Last, but definitely the cutest, is this treat jar filled to the brim with candy corn. This was originally a jar filled with yummy salsa from Amanda's Darn Good Salsa in Leadville, Colorado and I knew it would be perfect for this project. I painted and antiqued the lid with acrylic paints and then added a sweet little top to it. I cut a label out of a few of the patterned papers with a Spellbinders die and then added more stickers and a couple of banner flags. This will look great on the desk of someone very special to me who loooves candy corn! Thanks for checking out my blog! Bee Happy! These are amazing!!! I am coming to your house for Halloween! lol! I really need to get that paper pad!